Black Dymond Wheel Cleaner, Is engineered to completely and easily remove all Brake Dust, Dirt and Road Grime from Wheels, Brake Calipers and Rotors. Its Formulation consists of two acids, buffered to a level that will safely and totally emulsify Brake Dust residue. Black Dymond Wheel Cleaner will not harm any solid surface unaffected by water. At last, a product is available that performs the hard job of cleaning your wheels, by just spraying it on, wait 2-5 minutes, then hose it off without damage to you, your motorcycle or the environment. Black Dymond Wheel Cleaner is safe on all wheels. Chrome, Polished Aluminum, Contrast Cut and Powder Coated. 1. Be sure to apply product in a well ventilated area. 2. Apply to dry surface. 3. Spray all area of the wheel, calipers, rotors or anywhere in the Wheel/Brake area where Brake Dust has accumulated. NOTE: Coverage is very important, the product will not work where it is not applied. 4. Allow product to work and soften for 2-5 minutes. Blast treated areas with the jet stream position on your garden hose nozzle. NOTE: Frequent cleaners can achieve the amazing results with garden hose pressure, However, neglected wheels with HEAVY accumulation of brake dust, might require a pressure washer for complete removal or a second application using garden hose pressure. I have spoke wheels on my Spyder and they're a pain in the seat to clean and normally take 2 hours for all 3 wheels. With this product; it cuts my time in half spent on detail work on those spokes. 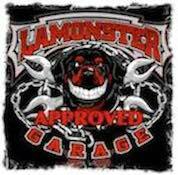 My back thanks me and I thank Lamonster Garage! I used another wheel cleaner that was great then the black diamond wheel cleaner became available so I had to try it, as always lamonster garage delivered, now I need to order more so I have enough to do my car. Thanks for another great product.